(1) Subject to the provisions of Clauses (2) to (5), a judge of the Supreme Court shall hold office until he attains the age of sixty- five years or such later time, not being later than six months after he attains that age, as the Yang di- Pertaun Agong may approve. (2) A judge of the Supreme Court may at any time resign his office by writing under his hand addressed to the Yang di- Pertaun Agong but shall not be removed from office except in accordance with the following provisions of this Article. (3) If the Prime Minister, or the Lord President after consulting the Prime Minister, represents to the Yang di- Pertuan Agong that a judge of the Supreme Court oath to be removed on the ground of misbehaviour or of inability, from infirmity of body or mind or of any cause, properly to discharge the functions of his office, the Yang di- Pertaun Agong shall appoint a tribunal in accordance with Clause (4) and refer the representation to it; and may on the recommendation of the tribunal remove the judge from office. (4) The said tribunal shall consist of not less than five persons who hold or have held office as judge of the Supreme Court or a High Court or, if it appears to the Yang di- Pertaun Agong expedient to make such appointment, persons who hold or have held equivalent office in any other part of the Common Wealth and shall be presided over by the member first in the following order, namely, the Lord President of the Supreme Court, the Chief Justices according to their precedence among themselves, and other members according to the order of their appointment to an office qualifying them for membership (the older coming before the younger of two members with appointments of the same date. (5) Pending any reference and report under Clause (3) the Yang di- Pertuan Agong may on the recommendation of the Prime Minister and, in case of any other judge after consulting the Lord President, suspend a judge of the Supreme Court from the exercise of his functions. (6) Parliament shall by law provide for the enumeration so provided shall be charged on the Consolidated Fund. (6A) Subject to the provisions of this Article, Parliament may by law provide for the terms of office of the judges of the Supreme Court other than their enumeration. (7) The enumeration and other terms of office (including pension rights) of a judge of the Supreme Court shall not be altered to his disadvantage after this appointment. (8) Notwithstanding Clause (1) the validity of anything done by a judge of the Supreme Court shall not be questioned on the ground that he has attained the age at which he was required to retire. (9) This Article shall apply to a judge of a High Court as it applies to a judge of a Supreme Court, except that the Yang di- Pertuan Agong before suspending under Clause (5) a judge of a High Court other than the Chief Justice shall consult the Chief Justice of that Court instead of the Lord President of the Supreme Court. On this subject..I wonder what is happening to all those judges that were proven not working with cases not closed….one I recalled reading with 33 cases under him…even murder cases…not concluded with his decisions. No humans can be fair in judgment at that stage. Why no news on that? On the above post….lets hope our new King will exercise his Rights. I recalled Mahathir did made a remark saying it is all ceremonial and if any defiance….parliament approval will need to be obtain…indirectly saying King can never stop anything UMNO wants to do….yet he is now complaining not enough democracies by Pak Lah….but lets leave them cutting their own throats….as if we have not seen enough of such back stabbings…within BN and UMNO. Do they really care for the country or for themselves? This sitting pretty cj should not be asked to step down – instead he should be fired for being a disgrace. oh yeah … not to forget the law minister – mr negative. they have been in cahoot with each other – apparently scratching each other’s back protecting something of “great diabolical interest” -hopefully somewhere in time the truth will unveils. It is a real pity that the Petition Rakyat with its 10,000 plus (and growing I am sure) signatures was initiated before this latest Lingam – Ahmad Fairuz earthquake. Given the enormity of the matter, and especially the provisions of Article 125, there is much cause for another petition I think. It is proper that the petition be to the PM to afford him the opportunity to act as is direly needed. His personal track record, as well as that of his Cabinet and government machinery, may not exactly inspire confidence that they are cognizant of the full facts of the matter (witness the number of “I don’t know” incidents), or that they will act expediently as is evidently needful, but it is right that he be given the chance to prove his doubters wrong. No proof he is speaking to another..as there is no return voices heard. See..how smart they are..if they want to be…as he is right…lawfully..but downright wrong…if he has any commonsense. But Min. of Law is smart to tell police go interview all concern and come out with a report …and Bar Council is hopping mad. Wayang Kulit starts again? Worst of all…..PM is Stone Cold Austin ….QUIET!! But PM and Najib had buka puasa with the person whom Lingham predicted to be Lord President…came true. Lets see what’s next…as nothing happen…voters should all wake up to the truths …once and for all. 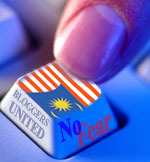 The fall(literally) of MoreTar Abdullah was unexpected and made no impression on such ppl like FatTail and FarRuse.